We provide Arabic calligraphy services for individuals and businesses that range from classical styles to modern Calligraphic rendering.My work in Calligraphy supports often specific requests for branding, logo design,Arabic writing Tattoos, graphic design, book covers, posters, and various titles. 3 Arabic calligraphy in various media for display at home or business. 4 Tattoos designs Arabic calligraphy, isomorphic Arabic writing tattoo etc. 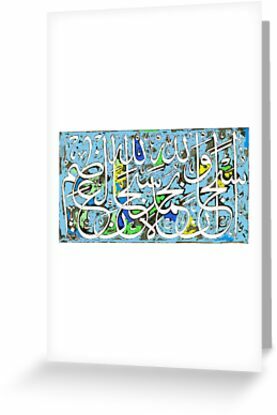 5 Custom Arabic and Islamic Greeting Cards for organizations and corporations. 6 Calligraphic designs for Mosques, Community Centers, Schools, and other buildings and projects. 7 Personal Name Calligraphic Designs. 8 Arabic calligraphy and typography in various media and styles for publications. 23 Commission services for all above fields. 24 Sketch of every type,every thing except nudes. All of the images associated with my Redbubble account are protected under my copyright – please respect my copyright. As I will respect yours. 4.Khawaja Fareed Award From Multan Arts Forum. 5.Work Selected and displayed in American Islamic Community Complex,New Yark,U.S.A. 6.Organizer Dabistan Faroghe Khattati Multan Pakistan. 7-Awarded From The CMH Multan,For The Best Interior. 1.Guide Book for Urdu & Eng. Calligraphy – 1998. 4.The techniques of Straight writing- 2009. 5.The techniques of Joining writing- 2009. 3-PTV News During My Solo Art Exhibition Held in Multan Arts Council ,Dated 25th Sep.2004. Motto; To promote the Art of Calligraphy to produce the interest of beautiful handwriting in the society. Write ups about my Art work have been Published in below listed News Papers & Magazines. 2 Daily The Nation ,Sunday,October 4,1998. 3 Daily Saboot Karachi,Wednesday, March 15, 2000. 4 Daily Nawa-e -Waqt Multan,June 12, 2001. 5 Monthly Magazine”Manzil” Sweden. August 16, 2004. 6 Monthly Magazine “Kaleem”Multan.December 7,2005. 7 Daily “Nawa-e-Waqt”Multan June 6,2008. Free Offer "Get your name design in Arabic Calligraphy "
Free offer "Arabic Calligraphy Names Designing"